Taiwan had never really been somewhere I really wanted to visit- afterall, how many people would include it in their list of top 10 holiday destinations? But then pictures started popping up all over my Facebook wall of food, food and more food from various friends who’d gone to Taiwan and I was sold! As we’d been planning on going to Hong Kong anyway, we managed to make a short side trip to Taipei which was only an hour and a half away. And what’s a trip to Taiwan, without a visit to their famous night markets? We’d taken an afternoon flight, so by the time we reached the hotel, we popped our bags down and headed straight to the closest night market. I don’t normally blog about accomodation in my travel posts, because food is what I’m all about, but we’d been recommended this hotel by a friend, and it was absolutely perfect for a foodie like me. With the famous eat street, Yong Kang Street just across the road, Shida night market a short walk away, and a MRT station just below (which also happens to be on the most convenient line for all the foodie destinations), there is probably no better place for a foodie to stay. And it also helps that the place is clean, modern and the service is great! The walk between the hotel and Shida market is less than 15 minutes, but because we weren’t that fond of walking, we opted for a short train ride instead since fares are ridiculously cheap in Taipei. Get this- getting from one end of the MRT system in Taipei to the other end (i.e. the longest possible trip) on an adult fare actually costs less than me travelling one station (i.e. the shortest possible trip) in Sydney on a concession fare! We got a little lost on the way to Shida night market, not because we were walking in the right direction, but rather, we’d been venturing on the edge of the market for a while before we realised most of the action was in the inner lanes and streets. Plenty of food, fashion and other interesting stores were to be seen, though it was much smaller than we’d expected. Most of the food stores were concentrated around the end of the market, where we got a little too excited and tried a bit of almost everything we could see. We particularly loved this store selling little snacks, most of which we had no idea as to what they were. It’s a buffet-like system where you grab what you want into a small metal bucket, then they add up everything you’ve taken and pour it into a paper back with a couple of skewers for you to eat on the go. 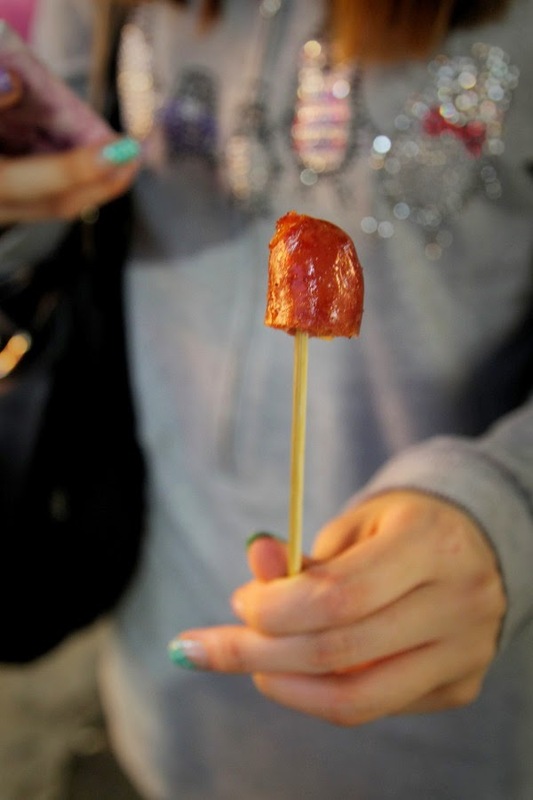 To be honest, I don’t really remember what I ate- too caught up in the excitement to even think about what I was eating, but I do remember this Taiwanese sausage! It’s quite different to Aussie sausages as it’s a lot sweeter, reminiscent of the chinese lap cheong. We developed quite an obsession with these sausages over the course of the trip, though this one was our favourite- we’re not sure if it’s because if it was because it was actually better or if it was only because it was the first. But yeah- there’s plenty more Taiwanese sausages in the posts to come! My friend had given me two specific recommendations for Shida night market, one being ‘lu wei’ (鹵味) which is where you can choose from a variety of ingredients (tofu, meats, veggies etc), and they’ll cook that in a special soy based sauce. We’d had trouble finding that particular store, so when the smell wafted across from another lu wei store whilst we were buying snacks, we knew what we were having next. There wasn’t much seating, being a market stall and all that, but wait a while longer whilst your food is being cooked and there’ll be a seat as diners eat quite quickly- there’s no lurking around here! We got ours with a bit of everything, which was perfect for sharing especially since it was such a huge portion. The flavour is really strong, and you can taste it best in things like radish which soaks up the sauce quite well. We couldn’t help notice the tofu stall next door, which had huge tubs of tofu in the metal storage container. As it was relatively early into the night, it wasn’t too busy but we were in the mood for a bit of dessert before continuing, so we grabbed a couple to share. There’s a couple of different toppings you can add onto the tofu, and you can choose whether to have it hot or cold. But it gets a bit confusing when there’s a couple of specific combinations and some which can only be had hot/cold, and the shop keeper was losing patience trying to explain so we just ordered randomly….. It was too warm for a warm tofu dessert but the mung bean tofu only came warm so we ordered it anyway. Glad we did though- it was definitely our favourite of the few that we tried, and the warmness makes the tofu a lot silkier than the cold version. Shida isn’t mainly a food market- there’s heaps of other interesting stores to explore, including plenty of fashion/beauty stores for the girls 🙂 We passed this small pan fried bun store which looked a little out of place, sandwiched between a couple of clothes stores and could not resist the sight of pan fried buns being made freshly on premises. It’s a little different to the versions I’ve had in Shanghainese restaurants- this outer wrapping is more pastry-like than like a steamed bun so it felt more like I was having a dumpling than a bun. It’s also rather oily on the outside, but it does come piping hot (straight from the pan of course) which made it particularly enjoyable (though it was difficult trying not to burn your mouth!). More dessert as we passed a dessert house and decided that we wanted to try some Taiwanese desserts. I’d wanted to try their mango shaved ice but they’d run out of mango that particular night so we ordered the green tea shaved ice instead with a red bean and condensed milk topping. The green tea flavour of the shaved ice wasn’t the best, but I do really enjoy shaved ice when it’s in nice neat layers like this so it did make for a refreshing and enjoyable dessert. Wish more places in Sydney did shaved ices! We thought we’d passed all the food for the night, and seeing as we were pretty full, decided to head back to the hotel.And as luck would have it, we passed the store my friend had recommended on the way back!! It’s exactly the same style as the lu wei we’d tried before, only this one seemed much more popular with a huge crowd gathering around it. We originally wanted to eat in, as they have a seating area up the back, but every diner must also order a drink in order to enter the seating area, so we thought we’d save the trouble and get takeaway instead. Perhaps it was the lack of atmosphere, or maybe it was because it had gone a little cold but the time we reached out hotel, but as much as we enjoyed the flavours of this one (the sauce base was definitely more flavoursome), we did find that we had enjoyed the first one we’d tried more than this. Nevertheless, it was quite enjoyable! Across the road from the lu wei store was the other store my friend had recommended, which was the salted chicken store (literal translation haha). It’s sort of like a salad, where the base is the salted chicken, and then you pick from the variety of other ingredients on offer, mostly vegetables, which are also cut into smaller pieces and mixed together with the chicken. The chicken is hand shredded to order which is why each order takes at least a couple of minutes to make, so the wait is quite a bit longer than you may expect. It’s certainly well worth it though- they don’t offer any seating so it’s either eating on the go, or to take home (or to hotel in our case). The salted chicken is amazingly tasty, but contrary to what its name may suggest, isn’t overly salty. To call Tamsui Old Street (Tamsui’s eat street) a night market is a bit of a misnomer as it’s open and bustling during the day time as well. Unlike Shida, this one consists almost solely of food vendors, with a couple of souvenir shops in between. 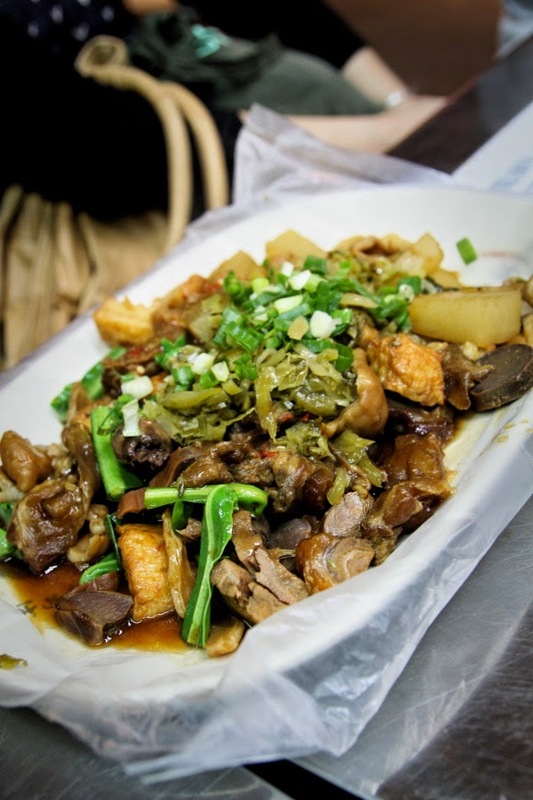 There’s just about any type of Taiwanese street snack you could possibly find on this long road, and as an added bonus, the street is nice and spacious so you don’t have to try to swim through the crowds! I’m not usually a fan of juices, but when there’s selection of super fresh and large fruits at the front of the store, most of which I’d never seen before, that’s a different story. You can juice just about any combination of fruits, though not all of them taste nice of course. No trip to a night market is complete without at least a couple of Taiwanese sausages so we head over to the first sausage stall we see and get our hands on a couple of sausages. This one’s the large version and sliced fancily so that it’s easier to eat. There’s nothing particularly interesting about fried squid- except when it’s presented as a whole on a skewer! The lady at the stall was nice enough to let us hold onto one to take pictures with, but unfortunately, they aren’t actually served like that. Because the squids on display were cold, the order of fried squid is actually reheated in one of the many air fryers at the back of the store, and then served cut up in a small bowl. Nowhere near as exciting as we’d expected and unfortunately, reheated fried squid doesn’t taste all that great. I’d been curious to try this aiyu drink since reading about it online so had been on a lookout for it. 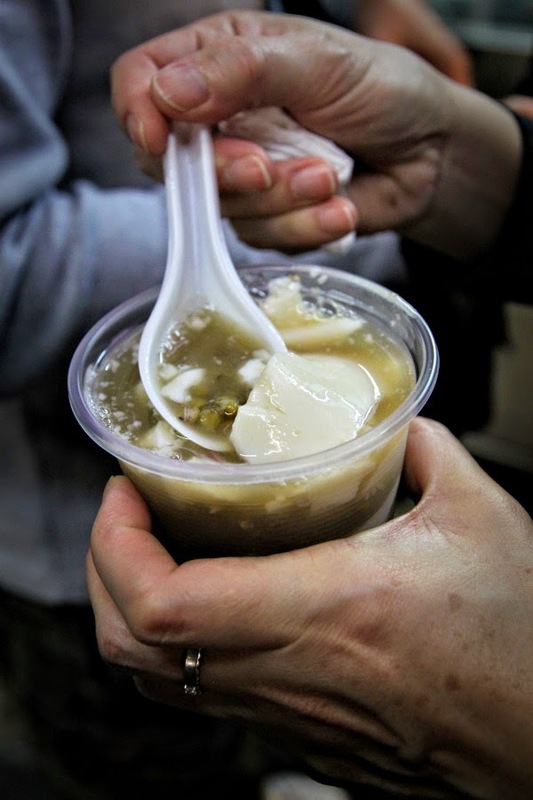 Not that it was hard to find- it’s quite a popular drink/dessert in Taiwan. It’s a very interesting drink- with soft, squishy aiyu jelly inside, kind of like the jellies you get in bubble tea. The drink itself was like lemon tea, only less sweet and much more sour. We loved looking at the handmade nut candies- the girls at the stall just kept cutting and packaging slabs after slabs of candies. They’re not the cheapest, but they are deliciously crispy and unlike any other Asian nut candy you’ve tried! When you reach the end of the street, that’s where all the food kind of ends, and it turns into quite a normal suburban street with various stores here and there. We did chance upon this xiaolongbao store a little way down, with steamers full of these delicious dumplings. They are ridiculously hot, but we could not resist popping the whole thing in our mouth. The wrapper is nice and thin, and there’s plenty of (boiling hot!) soup inside. We also walked by this curious building where a huge crowd of school kids were walking out of. I really wonder what’s inside a fish ball museum, but we didn’t have enough time to check it out. Would have loved a school excursion to a fish ball museum though- beats any excursion we ever had at school! It turns out that Tamsui fish balls are quite famous, which isn’t surprisingly seeing as it is a seaside village. We make a quick stop at a fish ball shop near the wharf to try some out. They’re rather oddly shaped- being long and cocoon like, and we’re surprised to find that it has some filling inside! Another Tamsui specialty is A-gei which we kept seeing everywhere along out walk through the town. It’s a large stuffed tofu, with a bit of noodles and meat stuffed inside cooked in special sauce which no one could really describe. 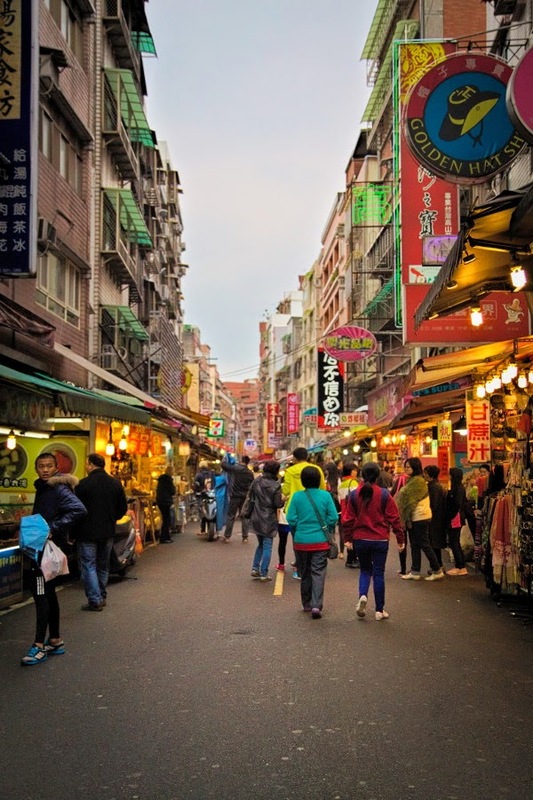 No visit to Taipei is complete without a visit to the largest night market, Shilin. We arrive a little early, just before the sun had completely set, so most of the vendors were either opening or were not yet open. Shilin is extremely big, and confused us a bit, with little clusters of food stores here and there, dispersed between fashion, sovereign and game shops. 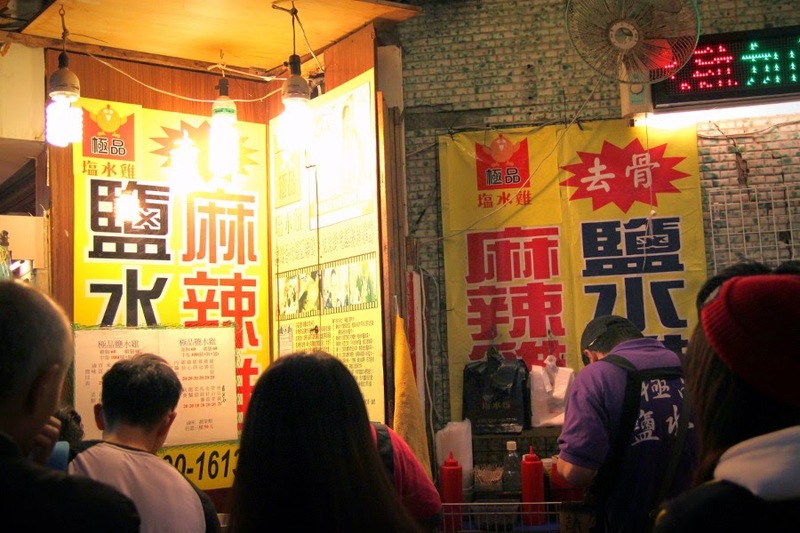 We’d yet to try Taiwanese oyster pancake, so we stopped by the first store that was open. These pancakes are ridiculously cheap, at 50NTD each (~$2) and are made fresh to order at the front of the store. They’re a little different to the HK style pancakes we’re used to, being more omelette like, with a little bit of starch paste mixed in to give it a chewy texture. The owner doesn’t seem to happy that we took up 6 seats, ordering only two oyster omelettes, so we quickly scurry out of here. The main food stores are located in the underground food court, where each store has its own designated seating- it’s not really street food anymore, but there is plenty of variety! 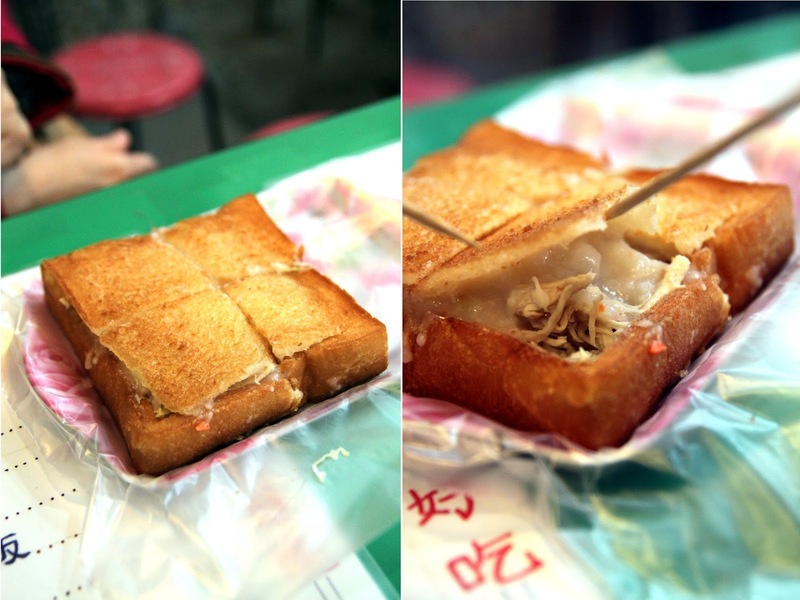 We’re excited to find this store selling coffin bread, which is more of a Tainan specialty. The thick slice of bread is deep fried to order, then a thin layer is sliced off the top, and filled with your choice of filling. We chose the shredded chicken filling, which also comes with a creamy sauce. It’s sort of like a sandwich, except bread is deliciously crispy! Cute bite-sized crabs! We’d love to try but given the limited seating within each store, it didn’t make sense to sit down to try one dish. The oyster omelettes in the food court look a lot more appealing than the one we tried at the other store! We’d also been looking to try smelly tofu, so when we smelt the sauce bubbling away at this store, we knew we had to try it! The sauce is quite different to what we expected- it’s tasty and pleasant, but we’re not sure we’re huge fans of it. We are however, big fans of crispy deep fried tofu, so we still enjoy it! We much prefer the outdoor part of Shilin night market, though trying to find the food is a bit of a hassle. Even finding our favourite night market staple, the Taiwanese sausage proved to be a difficult task, until we navigated our way to the main food street. This also happened to be the first time we witnessed raw Taiwanese sausages- is it strange that I’d expected them to look different to normal sausages? 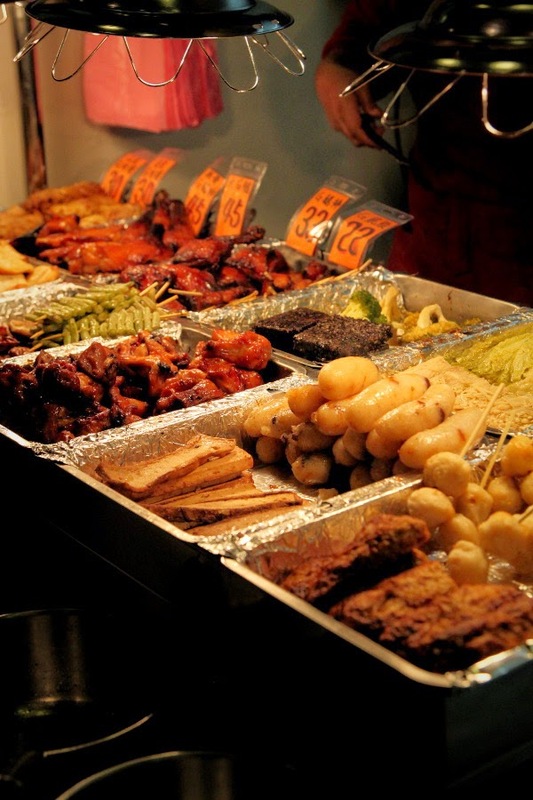 There’s just about anything you’d want to eat at the night market. There’s even freshly made pizza- which I would have loved to try, but didn’t quite have the stomach space for. The queues here are super efficiently managed. At Prince Cheese Potato, there’s staff members handing out menus and taking orders before you reach anywhere near the front of the queue. Not being any good at Chinese, I mistook the staff member for someone trying to sell me something from the store next door and ignored him the first time he tried to hand me a menu. Luckily I realised soon enough so I did eventually manage to get my hands on this cheese potato. It’s sort of like an Asian version of baked potatoes- with a crumbed deep fried potato, with your choice of filling and super creamy cheese sauce on top. It’s definitely a snack for sharing though- you wouldn’t have much stomach space left after eating this by yourself! I can’t say the others enjoyed it too much, but I was a huge fan. But that’s the beauty of night markets- there’s so much food, there’s always something for everyone! Gosh!! Really food galore. I'm sure it must have been a great time in Taiwan. Have not been but its listed on my list to go. I'd go nut at the night markets in Taiwan. Everything sounds so good!